In cities there isn’t much roof top area for harvesting solar energy. ZigZagSolar harvests solar energy from facades with the best looks and the highest electrical yield. In cooperation with technical universities and institutes we developed a product with dedicated software and dedicated solar modules. The availability of solar energy in cities leaves more capacity in the electrical grid for air conditioning HVAC and the introduction of electrical vehicles. Solar energy thereby indirectly helps in fighting air pollution and smog. ZigZagSolar perfectly harmonizes with newest regulations, incentives and models for sustainable buildings. 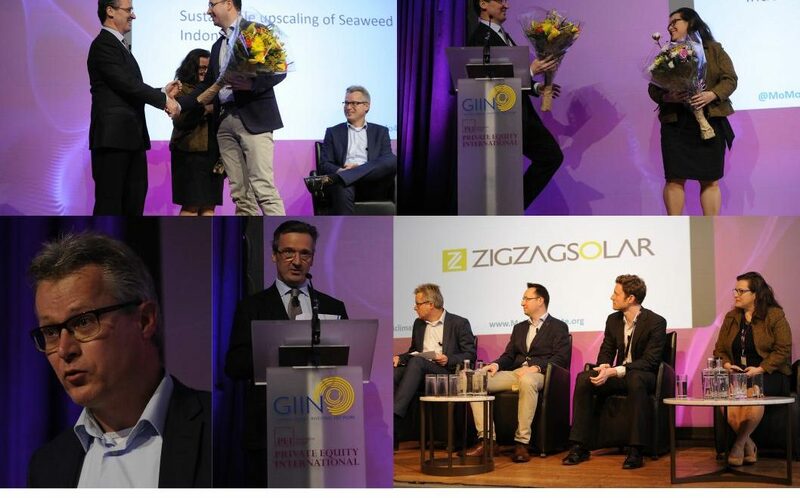 For that reason we presented ZigZagSolar at the Global Impact Investors Network (GIIN) by Private Equity Investment (PEI) and MoMo4climate. ZigZagSolar reached the finals. A second price among more then 50 contestants is encouraging. The first price was handed to the winners by Nick O’Donohoe from the Bill and Melinda Gates Foundation. info@zigzagsolar.com | +31 (0) 6 40 66 44 52 (Frank Bartelen) | ZIGZAGSOLAR Copyright 2019- All Rights Reserved.